There's a certain cachet about Lawrence Park that makes it one of Toronto's most exclusive residential neighbourhoods. Now there comes a prestigious new address that adds a chic urban brushstroke to this timeless canvas. Presenting 3018 Yonge in Lawrence Park. A boutique midrise statement of cosmopolitan elegance that complements the refined allure of this coveted neighbourhood. It's where location meets luxury to offer you a truly distinctive lifestyle. Welcome to 3018 Yonge. It's Lawrence Park – redefined. Announcing a dramatic presence on Toronto's main central artery, 3018 Yonge will be clean, crisp and cutting edge in its design. Horizontal bands of beige precast, punctuated by vertical seams of steel and glass, give it an arresting geometric profile. A soaring two-storey podium Lobby anchors the building to the street and offers an impressive welcome to residents and visitors. The exquisite lifestyle amenities at 3018 Yonge are designed to elevate your senses to the sublime. The spectacular Rooftop Pool, Hot Tub, Steam Room and Terrace Lounge is the perfect setting to enjoy quality time amidst gorgeous landscaping and unforgettable views. Trim the body and tone the muscle in the ultra-modern Fitness Room, equipped with an array of state-of-the-art cardio and exercise machines. Invite friends over for a celebration in the elegantly appointed Party Room. 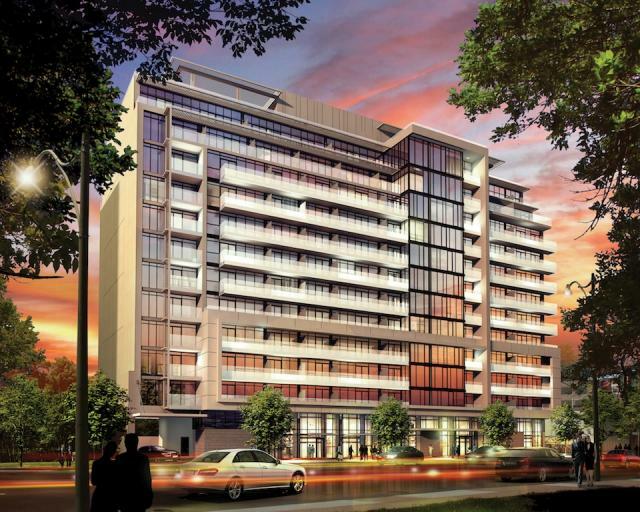 At 3018 Yonge, it's all about living life to the fullest.